Conservative Leader Andrew Scheer addresses the Conservative caucus on Parliament Hill in Ottawa on Jan. 27, 2019. The early themes of the 2019 federal election campaign will be tested on the floor of a new House of Commons as Members of Parliament return to Ottawa Monday. 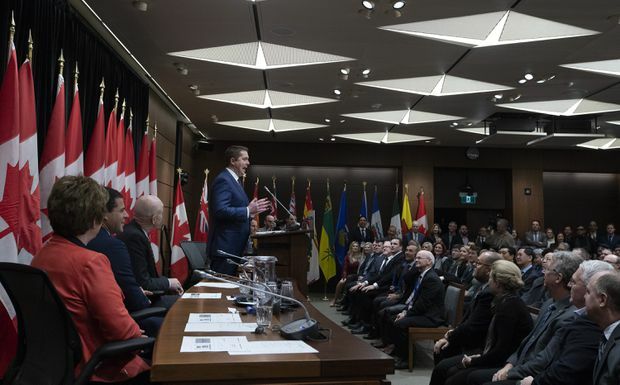 Conservative Leader Andrew Scheer rallied a gathering of his MPs and candidates on Sunday afternoon on Parliament Hill, where he said the party’s core message is that only a Conservative government will focus on balancing the books and making life affordable for Canadians. Members of Parliament will take their seats in a temporary House of Commons for the first time in a century on Monday as political parties square off for a final 14 weeks before the 2019 election. Diplomatic tensions with Canada’s top two trading partners – the United States and China – are poised to overshadow domestic issues, especially after Liberal Prime Minister Justin Trudeau fired his ambassador to China, John McCallum, on Saturday for repeatedly veering off script. The House of Commons and Senate Chambers in Parliament’s Centre Block are closed for at least the next decade for renovations, with MPs working in a temporary chamber in the neighbouring West Block. Senators will meet down the street in a former rail station turned conference centre. The last time MPs sat in temporary quarters was during a four-year period after the 1916 fire, which destroyed almost all of the original Centre Block except for the northern rotunda that houses the Parliamentary Library. During that period, the temporary House of Commons was exactly one mile south at the then newly constructed Victoria Memorial Museum, which is now the Canadian Museum of Nature. The Liberal government’s legislative agenda is expected to be light on new bills, with a focus on getting its remaining pieces of legislation passed into law before the House rises in June for the last sitting day before the October election. Several government bills – including C-69 which overhauls the approval process for large projects such as pipelines and C-58 which updates the Access to Information Act – are before the Senate. However, the Senate’s new temporary quarters won’t be ready until Feb. 19, which further adds to the time crunch the government faces in implementing its agenda before the next election. There have been no signals of major new bills coming from the government other than promises of two pieces of legislation on Indigenous issues, including a language rights bill and child welfare legislation. Government House Leader Bardish Chagger said in an interview that the Indigenous legislation will be introduced soon, but a date has not been confirmed. “We believe in the nation-to-nation relationship, so when it comes to this legislation on Indigenous languages and child welfare, we have to ensure that Indigenous communities are directly being consulted and part of the process,” she said. For the NDP, the short-term focus is on the Feb. 25 by-election in Burnaby South, where party Leader Jagmeet Singh is campaigning for a seat in the House of Commons. NDP MP Guy Caron, who is his party’s parliamentary leader, said the NDP’s focus in the House will be on issues such as the environment and income inequality. The NDP regularly accuses the Liberals of campaigning like New Democrats and then abandoning those pledges once elected. Mr. Caron said the Liberals appear to be trying that again with recent talk of supporting a national pharmacare program. The NDP’s focus will be on reminding Canadians of the Liberals’ broken promises and contradictions in the run-up to the 2019 campaign. Environmental issues will be front and centre, he said, with criticism of the Liberal government’s decision to support the Trans Mountain pipeline.